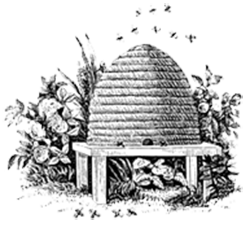 As our name suggests we are very passionate about Bees, which has led us to get involved in the rearing of Queens and making up of Nuclei for our own use and for sale. Beekeeping is a great pastime; it can be very relaxing and allows you to spend time with nature. However, this can only be achieved if your colonies are headed by good tempered Queens, which in turn leads to good tempered colonies that are easy to care for. At an early stage, I realised the importance of good Queens in beekeeping. Through both teaching from my local beekeeping association and help from other Queen breeders, I have established my own breeding system. This is an ongoing process of evaluation of colonies with different Queens, identifying any negative traits, and culling of the Queens that carry those traits. As a result, we now have locally bred Queens that are both prolific and gentle to handle. 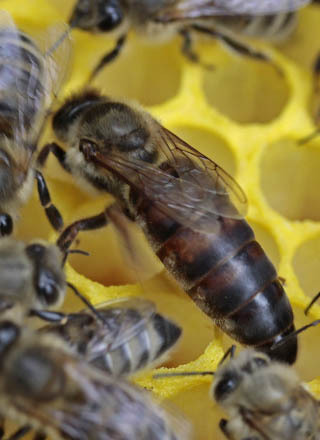 This season will be seeing a new move in our Queen breeding; we have a Buckfast ‘superbee’ breeder Queen. These Queens are bred following the systems laid down by Brother Adam, and their parentage is strictly controlled. We are in the very fortunate position of being able to raise the virgin queens in our own apiaries; they are then transported to the Dartmoor mating station, where they are allowed to mate with only selected Buckfast stock. This represents a huge step forward, because for the first time we will have control over the drones that mate with the Queens. We therefore know absolutely the pedigree of our Queens. These Queens, along with our own locally bred Queens, will be available for sale during the season. We sell them in Nuclei, or for you to introduce to your own colonies (see the shop for prices). Nuclei are available for collection only; Queens can be posted within the UK and will arrive in a cage with attendant workers and introduction instructions.